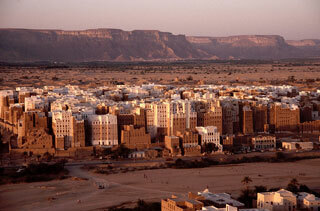 Surrounded by a fortified wall, the 16th-century city of Shibam is one of the oldest and best examples of urban planning based on the principle of vertical construction. Its impressive tower-like structures rise out of the cliff and have given the city the nickname of 'the Manhattan of the desert'. This article uses material from UNESCO World Heritage List article "Shibam", which is released under the Creative Commons Attribution-Share-Alike 3.0 IGO License.